All you need to do is sign up and we will get you started! Complete the Online Reservation Form and we will call you to confirm our receipt of your order. We will contact you again in Mid-October to reconfirm your sale dates and answer any questions you may have. Receive promotional material for your sale! We will ship your promotional items by November 1, so you can begin to advertise several weeks before the sale. Money Budget Envelopes are included for you to send home with students before the sale. Parents can place money in the envelope to help students budget where to spend their money. We supply ready-to-send Parent Letters on quality copy paper. Some schools include a personal note to parents printed on the back side of our supplied parent letter. We provide One Door Cover, Eight Table Covers, & Six Wall Posters at no charge to help you advertise the store to your teachers, parents, and students. The promotional materials arrive via UPS around November 1st, so you can start advertising several weeks before the sale begins. 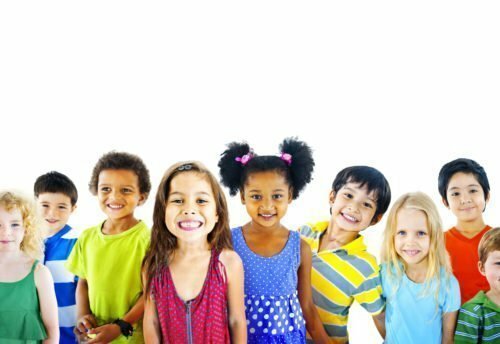 To run a successful and stress-free sale, most schools recruit between 3-5 volunteers. One trusted person can serve as the cashier and other volunteers can assist students with their purchases. We ship the kits to you and we pay for all shipping. The shop arrives at your school one week before your sale starts. All the gifts are organized in boxes and items are separated in neat sections. You do not need to sort anything. Just arrange the trays by number, open the lids, and you are ready to start shopping! Schedule students to shop by one class at a time. 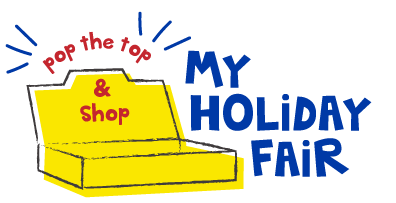 My Holiday Fair should last 3 days to allow all the students an opportunity to shop, but most schools run their sale for five days. Schools tend to run their holiday stores in the first or second week in December because everyone is in the spirit! You will receive printed “To and From” shopping bags in small, medium, and large sizes for students to use as gift bags. Also, we provide a plastic shopping bag for each student to carry home all of their packages and gift bags. All items are marked by number 1-18, not by price. The numbers correspond to the item’s price, with lower numbers being less expensive and higher number being more expensive. We number the items so that if your school chooses to add a percentage to the price as a fundraiser, you can easily use the number codes to signify prices. 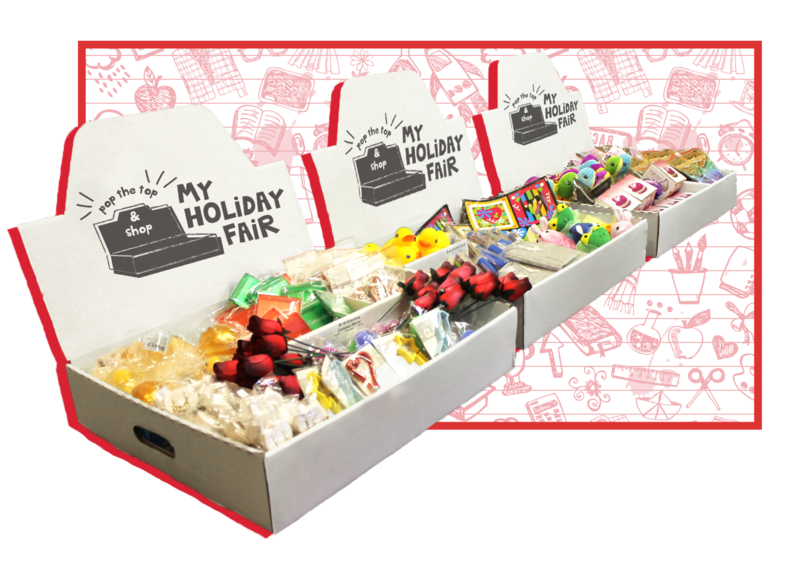 Most schools offer My Holiday Fair as a fun and educational service for their students. If you do want to use My Holiday Fair as a fundraiser as well, the reasonable profit percentage is anywhere between 10% and 50%. Most schools mark up the product only 10% so that the prices remain low. We will send you a Helpful Hints Manual that includes great ideas for your shop as well as samples of item markups to price the merchandise for a fundraiser. It is easy! Box up unsold merchandise in the least amount of boxes possible, put the UPS label on each box to send out. You will need to pack the trays into the original master case and return the remaining merchandise to My Holiday Fair. Prepaid shipping labels are provided, so you will only need to arrange for pickup. Place a copy of the Inventory Control Worksheets in one of the boxes, tape up all of the boxes and place the boxes in the front office where UPS will pick them up. We cannot accept return merchandise after January 15th. If UPS does not pick up the boxes, call us at 1-877-842-0624. Calculate what is owed and send payment. Payment is due within 5 days of the close of your sale. We do not send invoices so you should pay the amount you figured on the Grand Total on the Inventory Worksheets or Spreadsheet. Please do not put your check in with the leftover merchandise.